You guys might recognize this one! 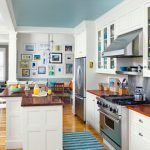 It’s only one of my favorite kitchens ever, designed by Abeles & Associates Architects as well as Katie Rosenfeld Interior Design, and I was thrilled to see it flipping through the June issue of HGTV magazine! 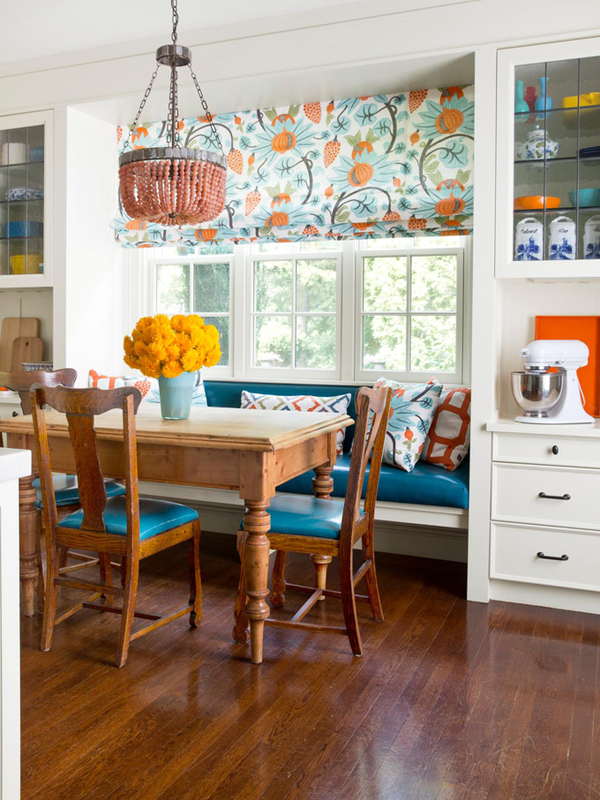 I wasn’t surprised to learn the homeowner, Amy Lipton, was a trained chef…but I had no idea she runs a cooking school called Joyful Kitchen right of this this fabulous Wellesley, MA space (photographed here by Keller + Keller and styled by Karin Olsen)! 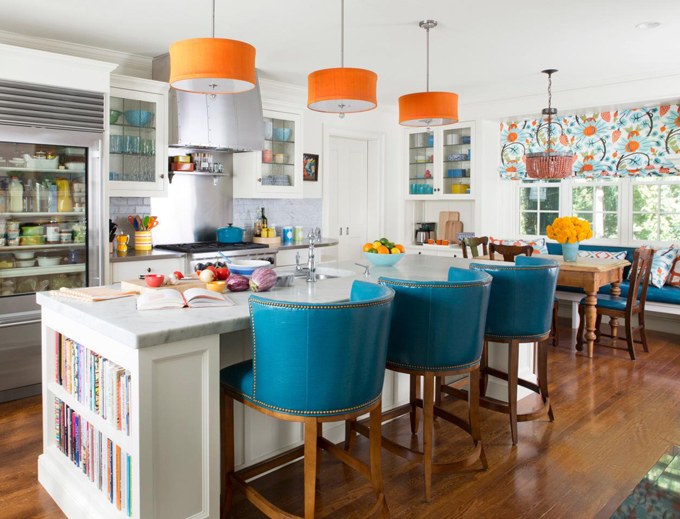 The beautiful marble-top island and pro-grade appliances are dream kitchen worthy, but it’s Osborne & Little’s Maharani fabric, the Currey and Company chandelier, and the durable peacock blue faux leather barstools that give the cheery room so much personality! Definitely the place I’d want to learn to cook! 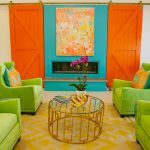 Read all about it right over here, and see the rest of the beautiful home here! I want those bar stools so much!!! I don't have anywhere to put them. But I want them. 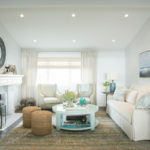 I've pinned this so I can tell my husband that our kitchen needs to look like this when we have it redone! I love how even you pin it button is turquoise! 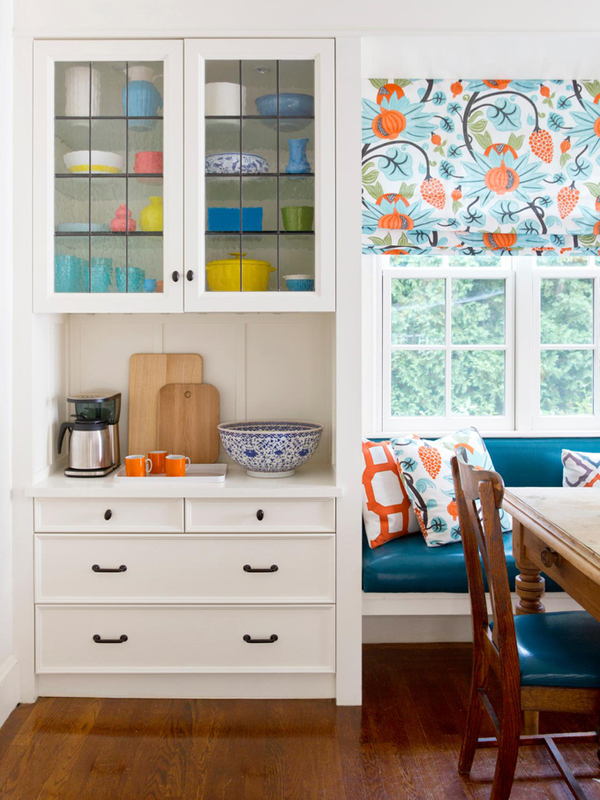 Hi, do you know where I can find the fabric for the kitchen curtains? I really want to make them for my kitchen.